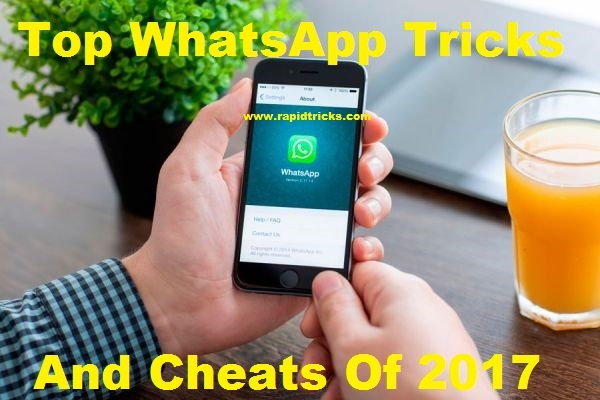 Hello, tricks lovers today I am here to share all the top “WhatsApp Tricks and Cheats Of 2018” with you. As we all know, WhatsApp is the largest using mobile application worldwide and growing rapidly day by day. But everyone doesn’t utilize WhatsApp to its best, so I am going to tell you the “top WhatsApp Tricks and Hacks of 2018“. Which surely gonna change your way of using WhatsApp. So let’s talk about the top WhatsApp cheats and WhatsApp Hacks. Before going deep into the article, first, let’s know some statics and basic information about WhatsApp. WhatsApp has over 9 billion users worldwide as of 2016, which makes it the most popular messaging application in the world. WhatsApp is available for all the operating systems such Android, iOS, Windows, Blackberry, etc. But everyone doesn’t utilize WhatsApp to its best. So today, I decided to write all the WhatsApp Tips and Tricks of 2018 in one place, which will help you to know WhatsApp’s amazing features and cheats. So let’s get started. There are many WhatsApp tips and tricks of 2018 and some of them I have already written in other articles. So I will write them here also with a link to them so that all the WhatsApp tips and cheats will be here in one place. Below I added a list to make it easier for you to know which tricks and features of WhatsApp are included in the article. There are two methods of using WhatsApp without the Phone number on any phone. I have written both the method in two separate articles, link to which on below. You can simply backup or save all your WhatsApp conversation including videos to your Google Drive by following the easy steps given below. Open Your WhatsApp and Click on Menu Icon in the top right corner. Here you can add your google drive account and set the backup frequency as well. You can Set backup frequency to backup automatically in the selected period. You can select if you want the Backup conversation only WiFi or WiFi and Cellular both. Yes, you heard it right, you can share a big file or any other file type with your friends or family using WhatsApp. Just follow these cool and simple steps to share a big file through WhatsApp. You just need to download DropBox application on your phone. After download sign into Dropbox and Upload the file you want to share with your on Whatsapp. Now click on “Create a Link” and click on See all. Slide down and select WhatsApp from the list. Now it will generate the link which you can send to any group or with any friend on Whatsapp. Now when they receive the link, they will be able to download or view the file on their phone. Note: You can control the permission of the file for your friend, you can allow them to “view only” or view and edit both from the file settings in DropBox. If you are facing any issue while using the trick given above, then you can comment below, and I will resolve the issue as soon as possible. We all know very well that how much important our privacy is in today’s time. We want to make sure always that our conversation on WhatsApp would be safe and no one would be able to peep into it in any way. If you set an application lock, and somehow, someone knows it then they can unlock any application on your phone including WhatsApp. So it would be better for you to encrypt WhatsApp via special protection application which is specially made for WhatsApp lock. Install this app and set a strong password to protect your WhatsApp application. After reading this heading, you would be thinking “WhatsApp Without Internet? Is it Possible? Really?”, Right? And the answer to your questions is “YES” it is possible. Let’s get deep into it. Now it is possible to use WhatsApp without the Internet using “WhatSim.” WhatSim is one of the latest Sims which is specially designed by Manuel Zanella (the CEO of the Zeromobile). Using the WhatSim, you can receive and send WhatsApp messages to your friends and family. The cost of the sim is 10 Euro with 1-year subscription, so you can send and receive WhatsApp messages for one year using this 10 euro of cost sim card. However, if you want to send and receive multimedia messages using WhatsApp, then you would need to upgrade to a higher plan. Check out this article to know more about WhatSim. Now it is possible to respond to any particular message in the conversation. You can quote any message you want to reply and write an answer for that, so another person will understand to which message you have answered. Scroll up or down to the message you want to reply. Click and hold the message, and now you will see the option to answer in the top section. Tap the Reply symbol and write your answer to this particular message. We can lose our WhatsApp conversation because of many reasons, and getting them back for reading is just like a dream come true situation. Everyone doesn’t know about it, but it is quite easy to recover or read your deleted messages on WhatsApp. WhatsApp saves all your conversations into your phone storage in WhatsApp Folder. Open the File Manager >Phone SDCard> WhatsApp > Databases – Here you will see “msgstore.db.crypt” file which contains all the message you have sent and receive in the same day and other files with the dates included on the name for Example “msgstore2018-3-12.db.crypt” contains the messages of the past week. You just need to open these files with any text editor, and you will be able to read all the messages. That’s it, and now your contact is saved as a shortcut on homescreen. Sending a file to your PC through WhatsApp is easy, and anyone can do this by following the simple steps given below. Now open contacts of your phone > click on your name and here you will see “Message +91*********53” with WhatsApp icon. Click on it to send and receive the message to yourself. Now open http://web.whatsapp.com/ on your PC and scan the QR code, here you will see your full WhatsApp on PC. Click on your own conversation and send any file, open your phone’s WhatsApp and you will see the file on your phone. With this simple trick, you can send or receive any file or message from PC to Phone or Phone to PC using WhatsApp. You can disable notification preview of WhatsApp in your phone’s Status bar, whether the phone is Android, iOS, or Symbian. Open WhatsApp > Click Settings > Click “Show message Preview” Just Disable it. Sometimes ago I had written a trick here on my blog about using two WhatsApp accounts in one Android Phone. In that trick, we used an application to use two WhatsApp accounts in one Android Phone. But now the time has changed and in the new version of Android i.e. Android Nougat, you can easily access two WhatsApp Accounts in a single Android Phone. And you don’t need to use any third party app for running two WhatsApp accounts. Follow the easy steps given below to run two Whatsapp Accounts in one Android Phone. Note: You must have Android 7.0 to run two WhatsApp accounts without any application. I am Assuming that you are using Samsung Android Smartphone with Android 7.0. If you have any other company’s smartphone then you can also find this feature on your phone, the only requirement is having Android 7.0 or higher. First of all, open the settings of your phone. Navigate to Settings > Advanced Features > Dual Messenger. Here you will see all the apps of which dual accounts you can use like WhatsApp, Facebook messenger etc. Just switch the trigger “on” of Dual WhatsApp and Goto homescreen of your phone. On the homescreen, you will find the secondary WhatsApp icon, just tap on it and signup using the different mobile number. Sometimes, we need to send a message to our multiple WhatsApp contacts, like when you invite your friends to a party or sharing an important info or message with all your friends. Now on Whatsapp, you don’t need to send a message to your different WhatsApp contacts one by one, instead you can send a broadcast message to all your contacts at once. It is very very easy to send a broadcast message to your multiple WhatsApp contacts. You just need to create a broadcast list by tapping the menu button on your WhatsApp screen, and click on “New broadcast”. Add WhatsApp contacts into the new broadcast and send your message to all at once. Your all the broadcast members will receive the message same as other messages from you without knowing that it is a broadcast message. I have written a separate article for this awesome trick, it is very easy to implement and it 100% works for all the users. If you find any issue using this tricks then let me know in the comment section below. Yeah, you heard it right! Now you can speak your message on WhatsApp and it will automatically be written what you speak. So you don’t need to keep writing with your hands and give them pain. Just give your fingers some relax and start speaking your WhatsApp messages now. Here it is how! When you type in the message writing box, here you will see a mic icon. Tap on the mic icon and start speaking and it will start writing what you speak. Is not it a cool feature? Yes, it is! So what are you waiting for? try it now! You can see if He, She reads your message or not very easily. But there is a condition and the condition is if they have enabled the blue tick then you will know if they read your message but if they have disabled the bluetick then you will only know it by their last seen. In the new version of WhatsApp there is a feature, when you send a message then if it delivered, you will see two ticks and if the message has read by the receiver then those ticks will be turned blue. It is very simple to know if they read your message or not, and I don’t think I need to explain it more to you. But if you still have a question then feel free to ask me in the comment section. The only drawback of this feature is if you have enabled this feature then you will also not able to know if the others read your message or not. Open your WhatsApp and click on settings tab from the upper right corner menu. Scroll down and uncheck read receipts option. Now no one will receive the read receipt of the message they send you and same applies to your messages. You can mark any message in your personal conversation or group conversation and read it later. It is a very beneficial feature of WhatsApp and allows you to remember a message and read it when you have time. In our busy schedule, it is hard to read all the group and personal conversations instantly. So when you receive a Text, video or audio message in your WhatsApp group then you can save it for viewing it later. So now you don’t need to waste your precious time in finding an important message in the long conversation of a group. Follow the simple steps given below! Just tap and hold the message you want to save for viewing later. Now click on the star from the top bar of your WhatsApp messenger. That’s it! Now your message has saved and you can view it later. To view your starred message just tap on the WhatsApp menu and click on Starred messages. There is an option in the WhatsApp to change all chat background at once. It is quite a good feature of WhatsApp and it allows you to give a background any background to conversations of your WhatsApp messenger. Just click on any WhatsApp conversation and click on the menu. Tap on wallpaper tab and select the wallpaper. That’s it! it will change the background of all WhatsApp conversation screens. Yes, you heard it absolutely right, Now you can use upto three WhatsApp account on a single android phone. The only requirement for doing so is you must have Android 7.0 (Nougat) or later on your Android Phone. You can run three WhatsApp accounts on one android phone with the help of WhatsApp GB. Let me tell you how the GBWhatsApp will help you in running three WhatsApp accounts on a single android phone. Android Nougat has a feature which allows Android users to use two separate accounts for the same app. Such as you can use two facebook messengers, Two WhatsApp, and other apps which allow two separate accounts on a single phone. So if you have Android Naugat on your Android phone then you can use two WhatsApp accounts by default and for using third WhatsApp account you will need to download GBWhatsApp on your Android Phone. First of all, You will need to enable dual messenger option on your Android phone so you can use two separate WhatsApp accounts. To enable dual messenger Go to Settings > Advanced Features > Dual Messenger and Enable it. Now you can use another phone number to signup for second WhatsApp account. So now you have two WhatsApp accounts on your phone and for running third WhatsApp account download GB WhatsApp from here. After download, install the app and register or signup on GBWhatsapp with the third phone number. Don’t worry if you have dual sim, you can still use third WhatsApp account. You will just need to enter another phone’s number while creating third WhatsApp account and verify it for one time only. That’s it! Enjoy three WhatsApp accounts on a single Android phone. WhatsApp has many awesome tricks and cheats that you can use to make your conversations fun and easy with your friends. Try any of the WhatsApp Trick you like from the list given above and let me know if it this article helps you in any way. So I have told you the Top WhatsApp Tricks and Cheats Of 2018, I will keep updating this post with the new WhatsApp tips and tricks. I hope you like the article and let me know in the comment box if you face any difficulty using any tip or trick given above. Do share the article with others and stay connected with us. Glad you like it, Keep visiting!